Seoul has loosened limits on mortgage borrowing to rescue GDP growth. The real problem, though, is two years of below-target inflation. That has hurt consumption by keeping the real value of household debt too high. Bold monetary easing might be more helpful. 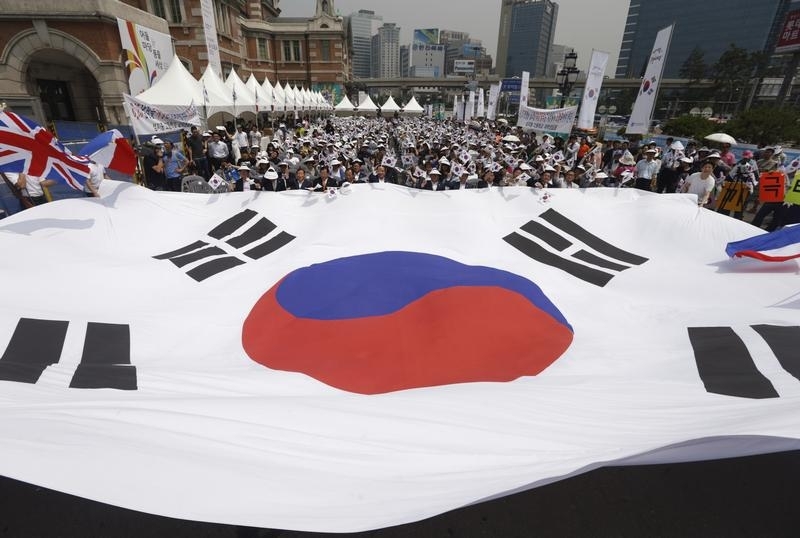 Members of the Korea Freedom Federation, a non-governmental organization, hold Korean flags during an event commemorating the 63rd anniversary of the outbreak of the 1950-53 Korean War, in Seoul June 25, 2013. South Korean President Park Geun-hye’s administration has eased prudential restrictions imposed almost 10 years ago on mortgage borrowing, while cutting the 2014 GDP growth forecast to 3.7 percent, from 4.1 percent previously. The maximum loan-to-value and debt-to-income ratios, which currently vary across the country, will be standardized at 70 percent and 60 percent, respectively, the finance ministry said on July 24. At present, most homebuyers in Seoul can borrow up to 50 percent of a property’s value, or half of their income. Korea’s household debt has more than doubled since 2004, reaching a record 1000 trillion won ($1 trillion) at the end of March. Of this, mortgage loans account for 41 percent, according to Bank of Korea. The ratio of household debt to disposable income stood at 163.8 percent in 2012, higher than the Organisation for Economic Co-operation and Development average of 134.8 percent. The government wants to reduce this ratio by five percentage points by 2017. The loosening of mortgage restrictions is part of a growth package that also includes an 11.7 trillion won increase in public spending. Additionally, state-run financial institutions such as Korea Development Bank would supply 26 trillion won of loans or other financial support to spur investment and help ease troubled small companies.